Well where do I start? You see an advert for a hotel near Snowdonia and the North Welsh Coast. 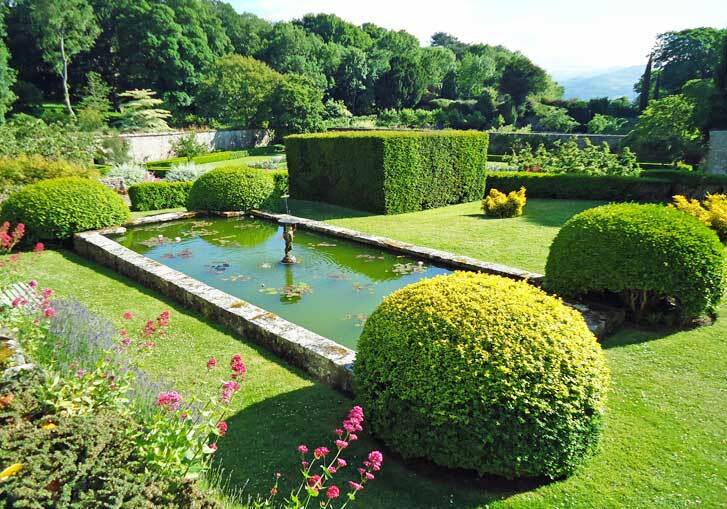 It is a historic house with a topiary garden kept by the National Trust. You must go and stay and hang the expense!! I might add that my bank balance took a hammering but it was an idyllic stay and I even used the swimming pool at the spa which is set discreetly down the hill in itsd own building. One word of warning though is that the garden is only open to guests and not the general public although some of your money does go to the Trust for upkeep. I don’t know if being a Life Member of the National Trust helps. (I bought this when I retired early from work). The beautiful one and I may have just been lucky to get a suite overlooking the gardens which are set on different levels. The designers have cleverly cut down the trees in the distant woodland so you can see a view of Conwy Castle about a couple of miles away in the distance. So to look out at various topiary gardens in blissful peace and quiet and see a major medieval castle in the distance was as if I had died and gone to heaven! 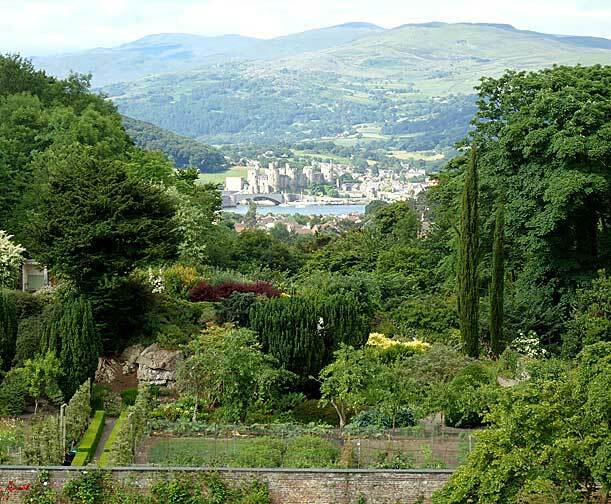 Because the gardens are laid out on a series of terraces and because the house itself is built on as hill you can look down from either the rooms or the top garden levels to everything below to get a splendid view of all the designs. 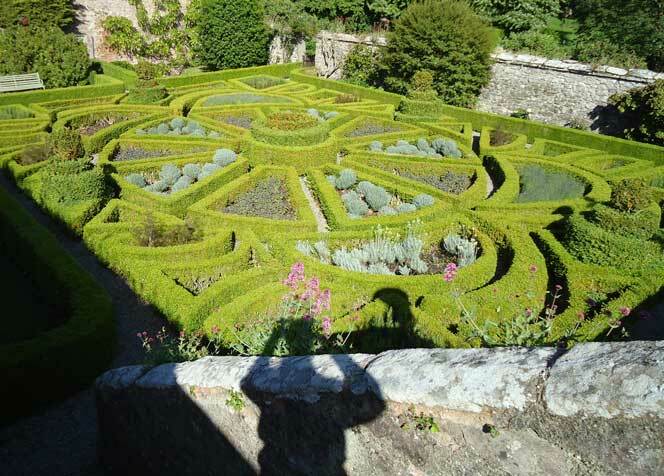 There are about four or five gardeners working there and lots of voluntary help and although some of the yew hedges have been around for several hundred years there is still some new planting, especially in the large open parterre. 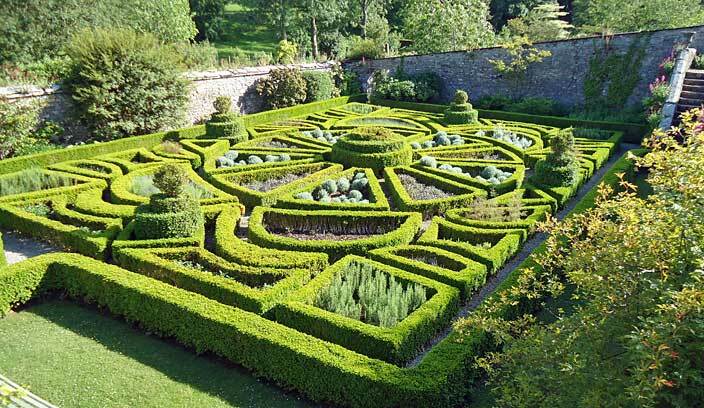 It is not really a parterre as you will see from the picture above but I just didn’t know what to call it. Lawns with sculpted box hedges marking compartments maybe? Although that is obviously a bit of a mouthful. Although the predominant colour is green from the grass and the hedges there is also an abundance of colour at Bodysgallen. Personally I think these colourful bushes and beds enhance the structure rather than diminish it. 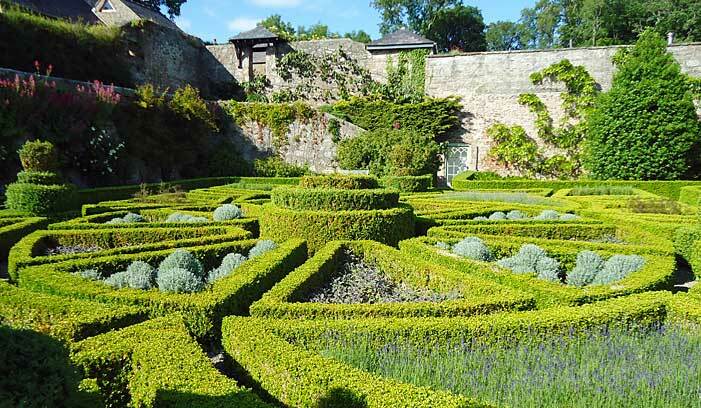 A lot of the terraces have walled edges making a series of walled gardens within a garden and one of the most splendid, to the topiarist anyway is the main parterre that dates back to the seventeenth century and which is just about as splendid an example I can recommend. It fills the space but allows you to meander around it. It has various upper levels to get differing views down onto it and it has lots of different inter planting in each segment to keep the interest going as you walk on.This is where many a philosopher or statesman probably chewed over a knotty problem of the day. We visited in early July 2015 when the temperature rose to thirty degrees celcius for about three days (and then that was the end of summer!) and you can see from the shadows how strong the sunlight was. It reminded me of trips to Italy or visiting the gardens of the Alhambra in Granada in Spain. 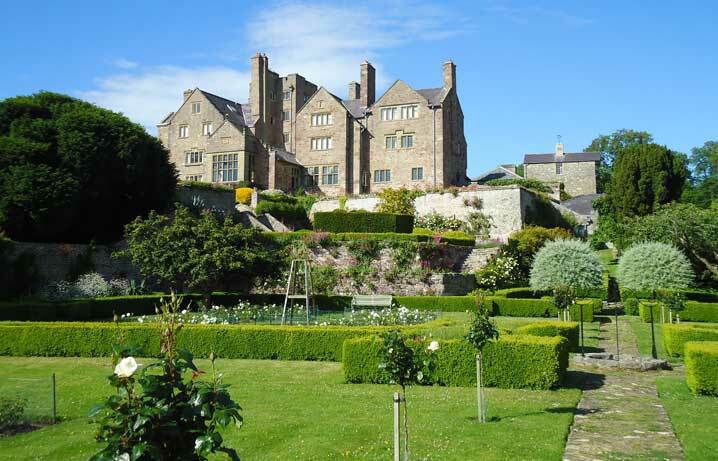 The hotel itself is Grade 1 listed and the main structure dates back to the Seventeenth Century. 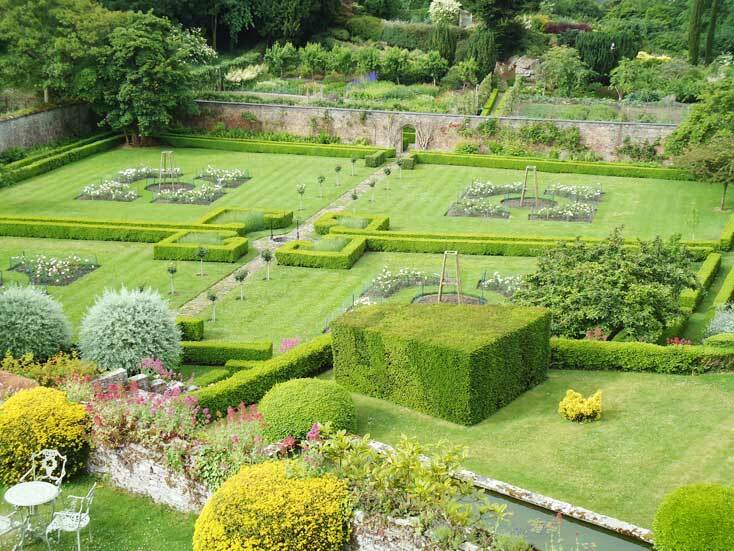 One of the interesting things about the place is that besides the rooms in the main building there are sixteen cottages dotted about the formal gardens and you may find you are billeted in one with its own little back garden leading out onto the parterre for example. This is truly Alice in Wonderland stuff. For those interested nearby LLandudno lays claim to where Alice Liddell stayed with her family and influenced Lewis Carroll in his writing of the Alice stories. We did see people playing croquet on one of the lawns one day but sadly they were not using pink flamingos as mallets! One of the levels has a pool. This is brilliant as it is lined by the same stone from which the building is constructed and provides fantastic reflections of the surrounding gardens as well as a soothing air for someone sitting nearby. You may have guessed that I can only sit down in a garden for less than fifteen seconds. 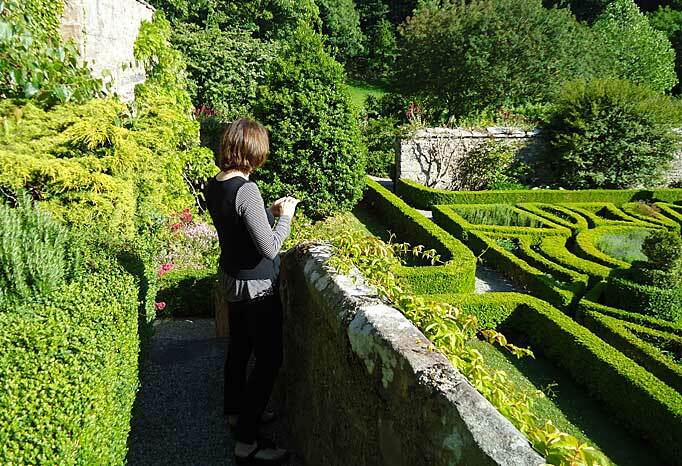 Everything about the scale of the gardens is superb although they have had four hundred years to get it right. If you get bored easily there is a wonderful pottage through an arch in a stone wall which has separate beds surrounded by box growing all sorts of produce for the hotel kitchens. I was told by one of the gardeners that they cannot grow everything for the amount of guests they receive but the chef likes them to grow exotic leaves and vegetables to supplement the table so it is very much a working space. Then if you are still not tired there’s another 190 acres of woodland to explore and you could probably spend a week there without ever having to go anywhere else. My advice is save up and go.